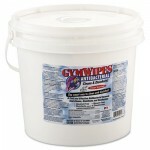 Premoistened, disposable disinfecting wipes that have been developed to stop cross-contamination on surfaces in the gym. Extra-thick, super absorbent 8″ x 6″ towelettes. Kill up to 99.9% of germs that can cause illness. Premoistened, disposable disinfecting wipes that have been developed to stop cross-contamination on surfaces in the gym. Extra-thick, super absorbent 8″ x 6″ towelettes. Kill up to 99.9% of germs that can cause illness. 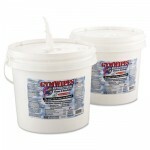 Large 700-count bucket dispenser. Includes two buckets of 700 each.